In May 2016, the Insurance Information Institute released the most up to date figures on numbers of liability claims, average insurance payouts, and other statistics. The average cost paid out for dog bite claims nationwide was $37,214 in 2015. In Arizona, the average cost was the highest in the USA, at $56,654. The top three states in terms of number of claims were California, Illinois and New York. 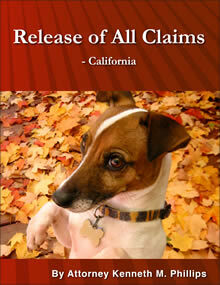 The state with the most claims was California, where the average payout was $44,983. See their press release. Also see their web page giving more in-depth information. Houston ranks first and Los Angeles a close second when it comes to dog attacks on the people who deliver the mail to us, according to the US Post Office. More than 5,500 postal employees were victims of dog attacks last year across the U.S. Texas, California and Ohio had two cities in the top 10 list of places where dogs bite the "mailman." See Postal Service Releases Top Dog Attack City Rankings, May 14, 2014. Dog owners need to understand that an attack on a mail carrier is not a Norman Rockwell moment (i.e., a pleasant slice of American life) but can produce terrible consequences. 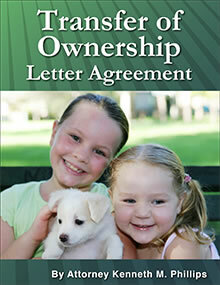 The dog can end up being taken away, its owner sued, and the delivery of mail halted. 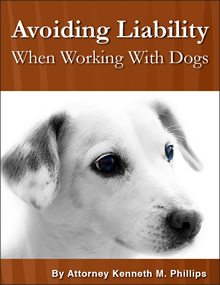 For the injured postal worker, there are two choices: federal workers compensation which costs the taxpayers money, and an insurance claim against the dog owner's policy of homeowner insurance or renters insurance. A Rottweiler killed a one-year-old boy in North Carolina on May 4, 2014. His name was Nyhiem Wilfong and it happened at his grandfather's house. The latter was asleep; no other adults were present. The dog was chained and accessible to the toddler and his older brother, and had lived at the household only 3 weeks. This accident was entirely foreseeable and preventable. Four of six factors from the Dog Attack Danger Scale were present: the breed was a Rottweiler, the dog was in its own yard with no master present, the dog was new to the household, and it was chained. The presence of two or more factors on the Dog Attack Danger Scale indicate that the dog should be avoided. In this case, there were 4 factors, and to make things worse, the children were unsupervised and the dog was accessible -- a prescription for tragedy. Parents and dog owners should be aware of the 6 factors set forth by the Dog Attack Danger Scale. To learn what they are, read A Dog Attack Danger Scale To Keep You and Your Kids Safe. A woman who suffered bites to her arms, face, neck, chest and nose when pit bulls broke into her home was awarded $2.2 million on August 12, 2011. (Read the article.) A TV interview with her can be seen by clicking here. Interesting reading: The Dog In The Room, by David Fleming, about "a uniquely American ethos -- one that has transformed dogs into our version of Hindu's sacred cows and one that exposes a deep-seated hypocrisy regarding animal cruelty...."
The Minnesota Supreme Court ruled that a young girl who was bitten while attempting to pet a friend's dog in a dark area might be barred from receiving compensation for her injuries, despite the state's strict liability dog bite statute. The ruling has the potential to help as well as hurt the chances of any dog bite victim to recover damages. For details, see A New Definition of "Provocation" That's Both Good and Bad. An Argentine Mastiff bit veteran anchorwoman Kyle Dyer on the face during a segment being filmed for the morning news. She later was listed in "fair" condition at the hospital. You can watch the video segment by clicking here. It demonstrates that dogs bite people without provocation. Warning: this is an upsetting video. A 6-year-old boy was mauled to death by a service dog on January 31, 2012, in Oak Grove, Kentucky. The boy was a guest in the home of a soldier living at Fort Campbell. The dog was a German shepherd. (Read the story.) This was the USA's second fatal dog attack in 2012. On February 16, 2012, Howard Nicholson Jr., 2-days old, was killed by his parents' husky while the child was sleeping in a bassinet inside the house. This happened in McKeesport, Pennsylvania, a state that has strict liability by judicial decisions. The mother of the deceased boy has been charged with a misdemeanor. On or about March 1, 2012, 59-year old Diane Jansen, a postal worker who was delivering mail, was attacked by a pit bull in Esondido, California (a statutory strict liability state), and she died on March 4. On March 9, 2012, a 17-month-old boy, Dylan Andres, was killed by a neighbor's rottweiler in Jacksonville, Florida (a statutory strict liability state). While his mother was unloading groceries from her car, the boy crossed the street from his home and encountered the dog which was chained in the front yard. On March 25, 2012, Kylar Johnson, 4, was killed by pit bulls belonging to a neighbor in Victoria, Texas, a one-bite state. On April 10, 2012, two pit bulls killed James Hurst, 92, as he was working in his front yard. It happened in Mead, Oklahoma, a strict liability state. Animal control departments in at least 24 U.S. states report that pit bulls are biting more than all other dog breeds. See the details at DogsBite.org. On May 12, 2012, Maryann Hanula, 72, of Surprize, Arizona, died from injuries inflicted by pit bulls in October 2011. On May 27, 2012, a neighbor's Labrador-shepherd mix dogs killed Ja'Marr Tiller, a 2-year-old boy in Mt. Pleasant, South Carolina. The child walked outside during the night, but it is unclear (at this writing) how he encountered the dogs. On June 13, 2012, 2-year old Jack Redin of St. Marys, West Virginia, was killed by two pit bulls in a neighbor's yard. The boy stepped through an electronic containment fence, which does not serve as a barrier to humans or even to any dog that chooses to ignore it. Police misconduct involving a police canine and clearly unwarranted use of force was captured on video: see the video showing the abusive misuse of a police dog attacking demonstrators in Anaheim, California. The article accompanying the video tells us that the police then attempted to buy the videos. Orange County, California, is considering an ordinance forbidding the owners of vicious dogs from getting another dog. This is significant because under current laws throughout the USA, a person can repeatedly violate animal control laws without additional penalties -- meaning that an irresponsible dog owner can have one vicious dog after another, without limitation. The important ruling in Tracey v. Solesky has been clarified but continues to stand, after the Maryland State Legislature failed to pass a law restricting it. 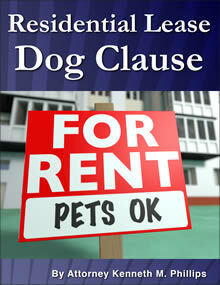 The case holds that pit bulls are inherently dangerous, putting everyone on notice, including landlords who are aware that a tenant has a pit bull on the premises. (Read the court decision in Tracey v. Solesky.) 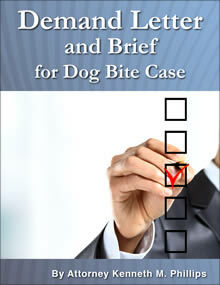 The court issued a clarification stating that the holding does not apply to mixed breed dogs that are part pit bull. On September 1, 2012, Dawn Jurgens, 76, was mauled to death by her two pet cane corsos in Trotwood, Ohio. On September 5, 2012, Bryton Cason, 4, was killed by a dog that the family stated was a bulldog. It happened in Donaisonville, Georgia. On September 7, 2012, Deborah Roberts, 45, was killed by her two pet pit bulls in Jefferson County, Arkansas. On September 11, 2012, James Hudson, a 10 month old, was killed by his grandparents' pit bull mix in Hertford, North Carolina. On September 20, 2012, 83 year old William D. Thomas was mauled to death by two rottweilers outside his home in Leeds, Alabama. The neighbors, Jerry Lenton and Jacqueline Lenton, had 33 dogs and have been charged with manslaughter and criminally negligent homicide. On September 24, 2012, a pit bull owned by his father killed 3-month-old Rayden Bruce in Burleson, Texas. On September 26, 2012, Nellie Davis, 61 years old, was mauled to death by her granddaughter's pet pit bull in Oklahoma City, Oklahoma. On October 2, 2012, 53-year-old Mary Jo Hunt of Pembroke, North Carolina, was mauled to death in her hom by 7 pit bulls that she had rescued. She worked for a rescue organization. On October 4, 2012, Tarilyn Bowles, only 3 weeks old, was mauled to death by a pit bull at the home of her parents' friend in Detroit, Michigan. On October 24, 2012, 55-year-old Robert Rochester, Jr., of New Castle, Delaware, died after being attacked by a German shepherd while Rochester was working as a mail carrier in Stanton. On November 9, 2012, 3-month-old Dixie Jennings was killed by her grandmother's rottweiler in Yadkinville, North Carolina. On November 11, 2012, Remedios Romero-Solares, 30, of Fallbrook, California, was killed by one or more of 8 American bulldog mixes. This was the 4th killing by a pit bull type dog in San Diego, a county which has adopted a no-kill policy when it comes to dogs but not people. On November 12, 2012, Dawn Brown, 44, of Big Rock, Illinois, was killed by a bullmastiff that she and her husband had recently adopted. On November 28, 2012, a dog owner shot an animal control officer to death in Galt, California. (Read Animal Control Officer Killed in Galt Shooting.) 65-year-old Joseph Corey, the alleged shooter, was described as being mentally ill by his former wife and a neighbor. Sacramento County Animal Control Officer Roy Marcum was killed while checking on dogs that had been left behind when Corey was evicted and the house was locked up. On December 11, 2012, Esteban Alavez, 34-years old, of Selma, California, died due to multiple dog bites. Authorities stated that 4 pit bulls killed the man. A total of 12 dogs were seized from the owner's home, including 7 pit bull puppies about 8-10 weeks old. The family of a boy who was killed by a pit bull has released the 911 calls that were made at that time. The recording is 9 minutes long and is horrific, sickening and gut-wrenching. There are few people who should listen to it, including those who believe that a pit bull attack is a media-made bugaboo, and lawmakers who are considering whether or not to enact reasonable limitations on who can own pit bulls and how these dogs should be confined. This audio recording is not for children or for after dinner. It can be heard here on YouTube. On December 13, 2012, Savannah Edwards, 2, was killed by a rescue pit bull at the home of a tenant in Shawnee County, Kansas. On December 26, 2012, Tomas Jay Henio, an 8-year-old boy in northwestern New Mexico, died after being mauled by feral dogs. The FBI is investigating the death because the attack happened on Navajo Nation land. It has been estimated that nearly half a million feral, usually starving dogs exist there. On January 14, the highest court in West Virginia affirmed the constitutionality of a breed-specific ordinance that prohibited the ownership of pit bull terriers in the Town of Ceredo. On January 8, 2013, Betty Ann Chapman Todd, 65, of Hodges, South Carolina, was killed by her son's pit bull in his home as she was babysitting for his children. On January 19, 2013, Christian Gormanous, 4, of Montgomery County, Texas, was killed by a killed by a chained pit bull in a neighbor's yard. On February 8, 2013, Elsie Grace, 91, was killed by two pit bulls in a motel room she shared with her son, the owner of pit bulls, in Hemet, California. On February 16, 2013, Isaiah Aguilar, 2, of Uvalde, Texas, was killed by a pit bull when he wandered into a neighbor's back yard to retrieve a balloon. On March 2, 2013, in Galesburg, Illinois, Ryan Maxwell, a 7-year-old boy was mauled to death by a pit bull at a relative's house. His mother said, "Half of his face was gone. And all of his throat. They had a wash cloth over half his face and his throat covered up. This thing did that to him. This thing just took our heart. It just took our soul." On March 6, 2013, Daxton Borchardt, a 14-month-old boy, was killed by his babysitter's two pit bulls in Walworth, Wisconsin. On March 27, 2013, Monica Laminack, 21-months-old, was killed by a pack of family pit bulls at the child's home in Bryan County, Georgia. On April 16, 2013, Summer Laminack, the child's 18-year-old mother, was charged with second-degree cruelty to children in the death of her daughter. Another reason to carefully investigate the history of any dog that you might be thinking of adopting: "dog laundering." 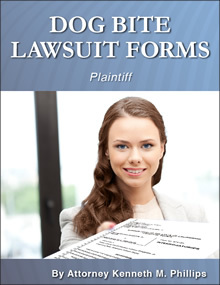 Attorney Kenneth M. Phillips uses that term to describe the practice of obtaining vicious dogs and obscuring their history for the purpose of putting them back into the community. See for example the recent article about thefts of pit bulls from an animal shelter in Columbia, South Carolina. The dogs in question might be used for dog fighting or sent to a "rescue group" and from there might end up next door. See also the article about a dogo Argentino that killed a man in New York, was released for rehabilitation to a place in Ohio, and then was stolen. ALERT: JURY DUTY SCAM. 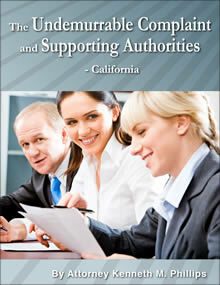 The FBI is warning about a scam related to identity theft and the court system. You may receive a phone call telling you that you failed to report for jury duty and notifying you of a warrant for your arrest. When you protest that you never received the jury summons, the caller will ask you for your Social Security number, date of birth and other information, supposedly to get the warrant recalled. The true purpose is to steal your identity. See "The Verdict: Hang Up." A neighbor who shot at pit bulls that were in the process of mauling an 11-year-old boy may face criminal charges for using or possessing his gun. At a time when Americans are debating gun control and the safety of our children, this incident illustrates some of the issues. Read D.C. Man Who Shot Dogs Biting Boy Could Face Charges. Join this discussion about this case at the Dog Bite Law Group on Facebook. It is worth noting that all 4 of the fatalities in April 2013 were caused by pit bulls. For more information on this breed, see the informative Pit Bull FAQ page on DogsBite.org. One interesting statistic: 7 out of 8 times in the year 2012, when you heard that a dog killed its owner, the dog was a pit bull. On April 2, 2013, Tyler Jett, 7-years-old, of Callaway, Florida, was savagely attacked by a neighbor's two pit bull-mixed dogs, and the boy died on April 7, 2013. The dog owner, Edward Daniels II, has been charged with manslaughter. On April 11, 2013, Claudia Gallardo, 38, was killed by a pit bull in the front yard of its owner's house in Stockton, California. 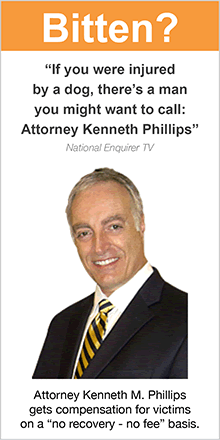 The adult child and two minor children who survive Ms. Gallardo retained Attorney Kenneth M. Phillips, the author of Dog Bite Law, to pursue the liable parties for the wrongful death of their mother. On April 22, 2013, Jordyn Arndt, a 4-year-old girl, was killed at her babysitter's house in Prarie City, Iowa, by the latter's pit bull. The babysitter, Jena Wright, 24, has been charged with two felonies and several misdemeanors in connection with this incident. One of the criminal allegations" "Defendant knowingly acted in a manner that created a substantial risk to the child's physical safety by leaving her unattended with a large American Staffordshire dog." This type of dog is one of the group known as "pit bulls." Two toddlers were mauled by a friend's pit bull while playing in his yard in Riverside, California on April 23, 2013. (Read the article.) The case is a reminder that parents need to know the 6 signs of pending trouble set forth in the Dog Attack Danger Scale. On April 24, 2013, a 2-year-old boy named Beau Rutledge was killed in his home by his parents' 8-year-old pit bull in Fulton County, Georgia. On May 4, 2013, Rachael Honabarger, 35, a resident of Coshocton, Ohio, died after being attacked several days earlier by her husband's German shepherd. On May 9, 2013, Pamela Devitt, 63, was killed by 4 pit bulls running at large as she took a walk in Antelope Valley, California, about 65 miles east of Los Angeles. The owner of the dogs was Alex Donald Jackson, 29, a resident of the area. The dogs had inflicted 150 to 200 puncture wounds all over her body. The pit bulls and Jackson had been involved in an attack on a horse and its rider months earlier. For these reasons, Jackson has been charged with murder. Learn more about The Pamela Devitt Case (People v. Alex Jackson) in a special section of this website. On May 13, 2013, Carlton Freeman, 80, of Harleyville, South Carolina, died from a dog mauling that happened on May 8th. This man was a double amputee who was attacked in his wheelchair. The breeds of the dogs have not been revealed. On June 9, 2013, Ayden Evans, a 5-year-old boy who resides in Moore, Oklahoma, was killed in Jessieville, in Garland County, Arkansas, when he was attacked by a Bullmastiff dog inside the home of a family friend. On June 18, 2013, Nephi Selu, a boy of 5, residing in Dixon, California, was staying at his grandparent's home in Union City, near San Francisco, California, when he was killed by their pit bulls. On June 25, 2013, a chained pit bull killed a 5-year-old girl named Arianna Jolee Nerrback of Effingham, Florence County, South Carolina. This is USA fatality number 17 this year. Pit bulls have been the killers in 16 of these 17 cases. On July 1, 2013, Linda Oliver, 63-years old, of Dayton, Texas, was viciously attacked by a stray dog she began caring for two weeks earlier. It was a rottweiler-mastiff mix. On August 30, 2013, Juan Campos, 96-years old, was found dead in his backyard in Katy, Texas, after being mauled by one or more pit bulls. On September 15, 2013, Jordan Reed, 5-years old, was mauled by a stray husky mix in Kotzebue, Alaska. On September 22, 2013, a 2-year-old boy in Gilbert, Arizona, identified only as "David" was killed by his babysitter's pit bulls, which also turned on the babysitter herself. The next day, on September 23, 2013, in Colton, California, 2-year-old Samuel Zamudio was killed by his family's 5 to 7 pit bulls. “His face was all eaten up. He was eaten from the face,” said a witness. His grandmother and uncle have been charged with child endangerment. On September 27, 2013, Jordan Ryan, a 5-year-old boy, died after being mauled by pit bulls at a babysitter's house in Baker, Oregon. Dog food and cat food by IAMS having a certain lot number has been recalled because it may transmit salmonela not only to your dog or cat but to you and your family. But don't throw away any unused food without first checking the lot number on the bag to the list published by the FDA (click the link). A pit bull owner in California was convicted of a felony and given probation and fines after his dog repeatedly bit and terrorized neighbors. The case of People v. Flores is interesting because it explains California's unique criminal law pertaining to "mischievous animals." In this state, if a person knows his animal is "mischievous" and fails to exercise ordinary care, and as a result a human being suffers serious bodily injury or death, that person may be prosecuted pursuant to Penal Code section 399, which can result in a misdemeanor or a felony (up to 4 years in prison). On November 1, 56-year old Terry Douglass was mauled to death by her pet pit bull in Baltimore. Prior to this, the dog had attacked Douglass twice before. On November 4, Katherine Atkins, a 25-year old woman, was mauled to death by her "boyfriend's" two pit bulls in Kernersville, North Carolina. On November 5, 65-year old Nga Woodhead died of a heart attack brought on by a severe attack one week earlier by two loose pit bulls. 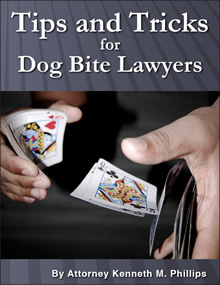 Details, prior canine homicides, and other interesting news about dog bites and the law can be found in our News Archive. 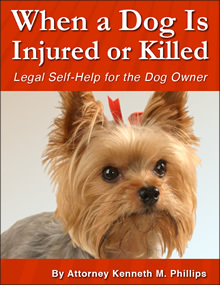 Join the Dog Bite Law Group on Facebook to discuss all this, and get up-to-the-minute reports @ DogBiteLaw on Twitter.